Pick a good quality piece of salmon. Whether wild-caught or farm-raised, choose a piece that’s evenly colored and has a shiny skin. Brush both sides with olive oil, or marinade before grilling. Make sure the grill is well-seasoned when you begin – brush the grates clean and wipe down with an oiled paper towel before you cook. 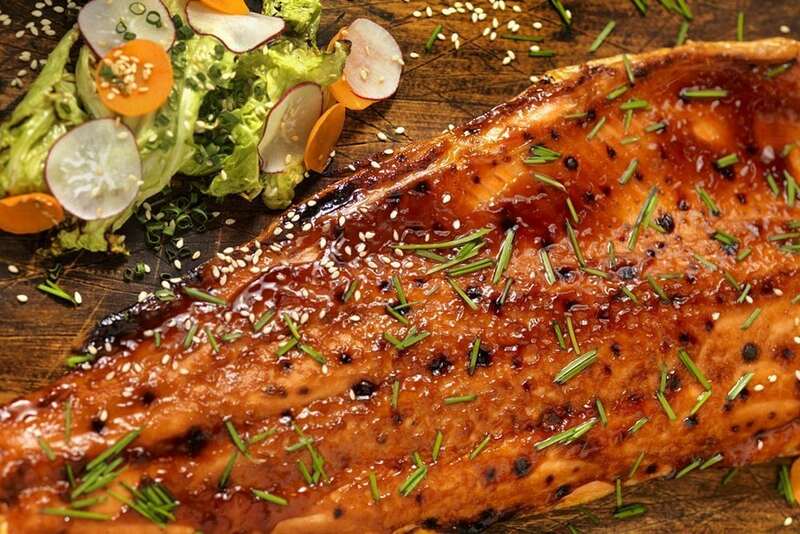 Preheat your grill – turn the burners up to high for 5-10 minutes, then turn down to medium/medium high heat for salmon. Some chefs recommend grilling salmon starting with the ‘flesh’ side down. It will be ready to flip when it has released from the grill grate. Check with a spatula under the salmon and carefully lift and flip when it comes away without sticking. Flip over to the skin side and grill a few minutes longer. A lot of white seeping out of the fish indicates it’s over done. A little white is what you’re looking for. Put the lid down to cook the thicker sections and pull off the grill when it’s still a little red inside. It will finish cooking as it rests. --OR-- Grill skin side down on a higher heat until it’s done. Be careful not to char the skin on a grill that’s too hot. Brush olive oil over filet(s) and seaon with lemon pepper, garlic powder and salt.